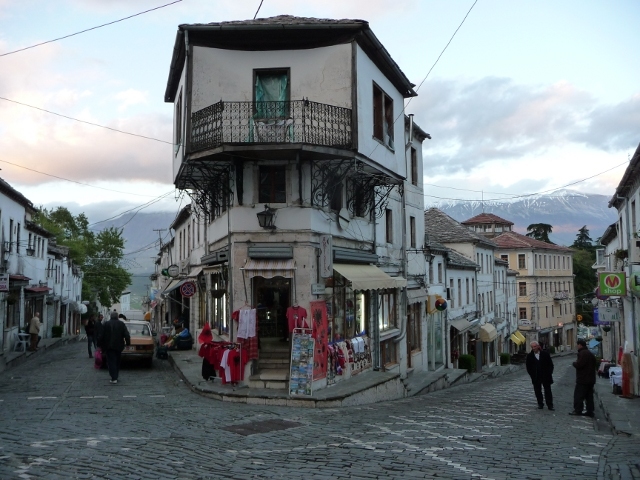 A UNESCO World Heritage town described as a ‘museum city’, Gjirokaster climbs several steep hillsides and is topped by an austere grey stone fortress. It is famed for its wonderful 17th century vernacular architecture – large family houses, some of them partially fortified, with uneven slate roofs. Its pink and black stripey steep cobbled streets glisten beautifully during and after torrential rain, which also makes them treacherous to navigate. It was pouring as we drove in and the surrounding mountains were all but obscured by low hanging cloud. It was the weather coupled with a lack of campsites or anywhere flat to wild camp in the area, that lead us to discover the family run Hashorva guest house in one of the historic houses. We were shown a huge room (around 10m long) with a beautifully carved wooden ceiling, cupboards inset into the walls and other details for not much more than the average campsite. They managed to squeeze the van through their gates onto the drive and after moving plant pots and pruning a few plants, we managed to pull forward just enough not to drop onto the path below and to shut the gates. Driving rain that looks set in for days is not pleasing to the spirit, but the lovely look and feel of Gjirokaster with its tall houses and long climbs, cheery cafes and shops made us venture out to explore. We followed intriguing paths and alleys at all angles between the beautiful houses as we started to get our bearings. In spite of its protected status, many of the houses are partly derelict long-term renovation projects, and quite a few have been lost completely. Albania was officially a very secular country under Enver Hoxha’s dictatorship, and religious worship was banned for many years. Now though, it’s returned to its mix of religions, and the call to prayer from the mosque beneath the fortress carried a musical fluidity that was totally different from those we’d heard in Tunisia, and the church bells rang out prettily too. We were enticed out of the rain into a souvenir shop by an enthusiastic proprietress, selling Enver Hoxha mugs among other delights. 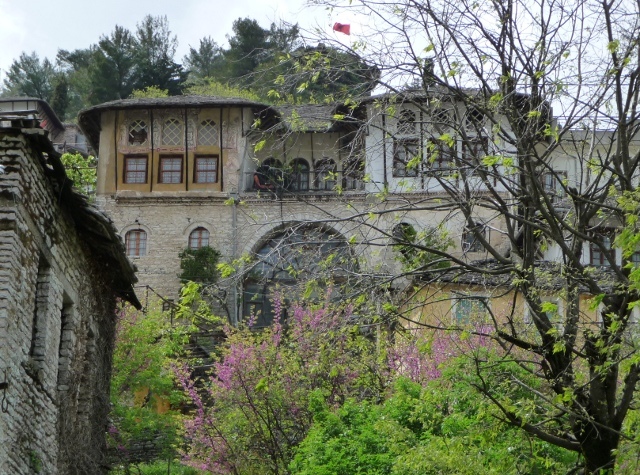 Enver Hoxha was born in Gjirokaster, as was writer Ismail Kadare, who won the inaugural International Man Booker Prize. The weather the next morning didn’t look very promising with the rain still continuing to fall. We made a steep ascent to the fortress and entered the dark dripping tunnels housing old artillary and a rather cute tank. We spent some time exploring the place – although most of the current building is from Ali Pasha’s time, in the 19th century, there was a settlement up here from the third century BC. It was also a one-time prison holding political opponents, used by King Zog, the Nazis and the Communists. The star attraction, however, is an old delapidated US plane. 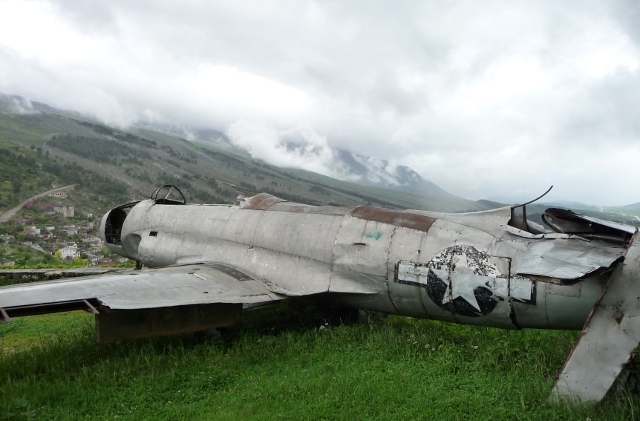 Heralded as a spy plane ‘captured’ back in the 1950s, it is now thought to have been forced to land on Albanian soil with engine problems during a training flight from an Italian base, the pilot was returned to the US. Strolling back down into town in search of lunch, we passed a woodcarver and a stonecarver at work in their neighbouring shops. We stopped to watch and admire their work. The next doorway had a flight of stairs leading up and it looked like more crafts people at work. It was much more than this. We had inadvertantly stumbled into the marvellous energetic work space of a UNESCO project bringing volunteer conservators from Britain, Italy and Bulgaria to look at the wealth of artefacts housed in the fortress, mainly firearms and textiles, and to start cataloguing and conserving them, while simultaneously training local people to carry on this important work. British textiles conservator, Janie Lightfoot, explained to us how the wonderful costumes had been kept in poor conditions, and had mice and moth damage, so there is an immense amount of work to be done. Dedicated local staff have long been struggling with a total lack of resources. There is to be a new museum opening in a couple of months where a lot of the pieces will be shown. 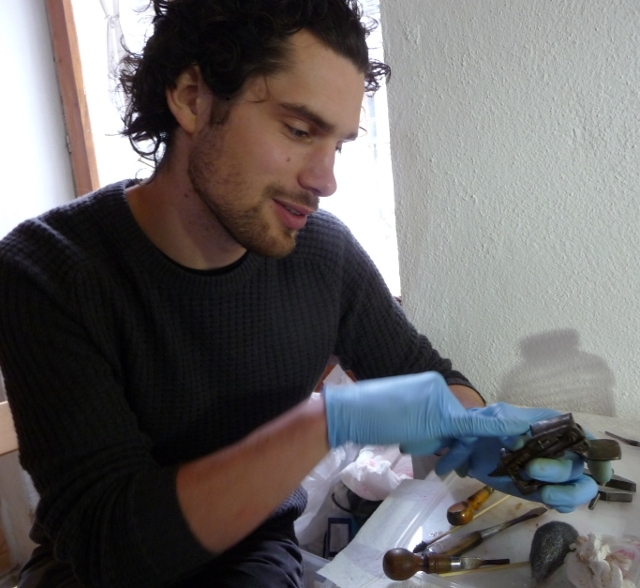 The volunteers had set up the work space, and helped to purchase most of the conservation materials locally – recording where they bought them so that this knowledge isn’t lost. We were recognised by our enthusiastic souvenir shop lady from yesterday, her face hidden behind a mask as she got stuck into cleaning a metal embroidered velvet jacket. Alma and her daughter are some of the local volunteers. Two arms conservators from London were working on beautifully carved guns, making them safe for display is one of their responsibilities. The enthusiasm and hard working atmosphere was palpable and we feel privileged to have been allowed to wander round and watch as the team got on with their tasks. The foreign conservators would only be in place here for a week, so were working round the clock to ensure they got as much as possible done, and they had already been interrupted and filmed by a local TV crew. After lunch the rain had eased and there were even some sunny intervals. We found the wonderful Zekate House high above the town, it didn’t seem to be open to the public though so we zigzagged our way down to the Skandulli House, a 17th century family home which is open to the public. The current owner of the house gave us an vibrant tour in a blend of French and Italian and we would have been happy to move in. The lowest level had former bunkers and food storage cellars and also a water cistern which collected rainfall piped down from the roof. The living quarters were on the upper floors behind the open wooden framed veranda giving views of the town below and the mountains beyond. The rooms were light and airy with beautiful lace curtains, pretty fireplaces and low seating around the edge, the guest sitting room having more ornate decoration. The feel and style of the rooms wasn’t dissimilar to houses we’d visited in Tunisia, particularly the one in Nefta. There were several different stairways up and mezzanines in some of the rooms for storage. The house had been commandeered from the family during the Communist era, and returned to them after its fall. 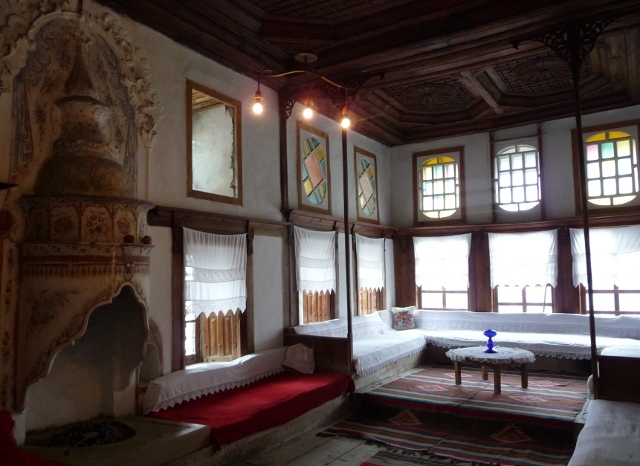 The Ethnology Museum nearby was in a converted traditionally built house on the site of the house where Enver Hoxha was born. It has some lovely costumes and furnishings on display, and the rooms were laid out in a similar way to the Skandulli House, but it paled in comparison and lacked the soul of a house that is cherished by the family that lives in it. 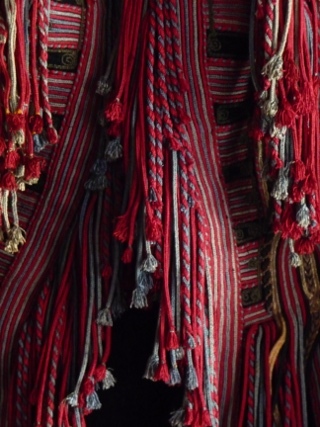 I was particularly taken by a red woven cloak with tassles – see photo. The conservators at the UNESCO project blanched when they mentioned how the costumes are nailed to the walls … There were several broken panes of glass too and a cold damp breeze was blowing in. It was another pretty house to look at though. We had a pre-dinner stroll out to a viewpoint of the distant and now visible snow topped mountain ridge where the sun cast its dying rays in an auburn stripe along the mountain side. We ate at a charming restaurant, Kujtim’s, where the maitre d’ was also the chef and waiter. As a result We had to wait a little while, but we were served with a mouthwatering feast of fresh mussels, grilled marinaded chicken, crisp arranged salads, toasted herby bread, grilled cheese and good local wine. The quality, freshness and variety of Albanian food has been a delicious surprise. We got talking to Lucy and Julia, travelling friends from the UK and Germany respectively. They were spending a week touring Albania by public transport and had been very taken with Tirana and Berat, but had been disappointed in their visit to a very off-season coastal resort where they had had some clothes go missing from their hotel room. After our meal we strolled back through the main crossroads of Qafat e Pazarit in search of a bar to have a raki nightcap, and spotted Lucy and Julia at a cosy place we’d had a cups of tea in earlier in the day. 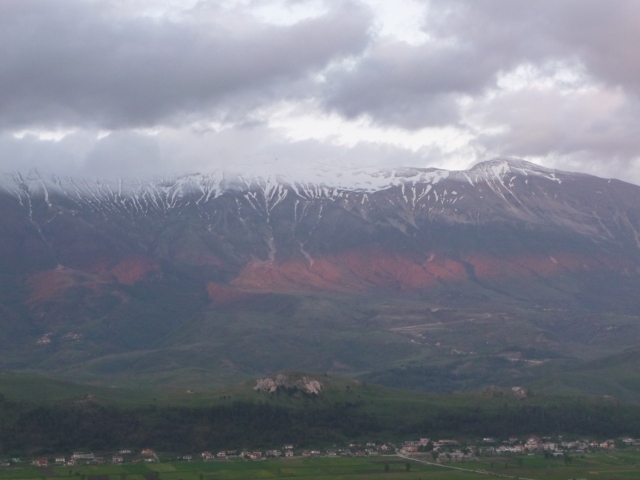 They asked us to join them, together with an Albanian travel guide they’d met at their B&B. Raki flowed and interesting discussions ensued. This entry was posted in Art & Culture stuff, By Country - Albania, Food stuff, Travel stuff. Bookmark the permalink. 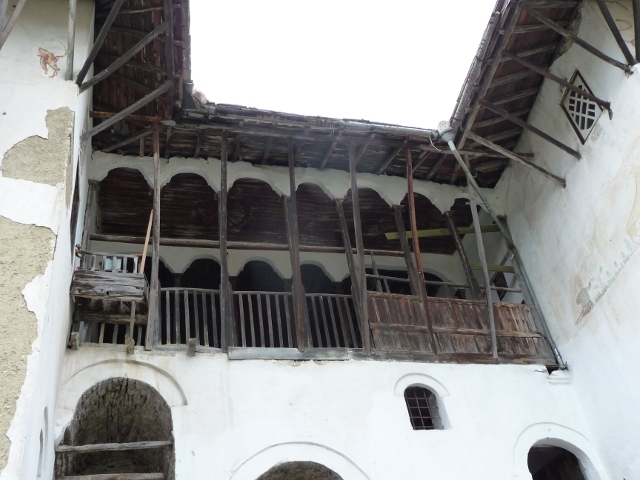 Great blog about Gjirokastra, just one thing re the textiles at the conservation project, about the way that we found them sounds very harsh and a little damming to the people who store them. I did not find them, they were found before I arrived, they were already in the freezer dealing with the moth problem. Yes the storage is not ideal and it was mice not rats, we must remember that this country has suffered a lot through it’s history, and people have done the best they can with absolutely no help at all from any government bodies to keep these museums and objects safe as they can. So maybe a little more sensitivity and awareness to the person who tries very hard to keep that storage together would be appreciated along with careful choosing of words. A little edit in that paragraph would help as I would hate her to read that. Apart from that I really enjoyed it and have enjoyed the rest of your blog. We’re thrilled that you’ve found time to read our blog. I wrote as I understood the situation to be and regret if this came across too negatively. I wanted to emphasise the enormity of the tasks the team faced during its week there and in the future, and the marvellous work you were all doing to improve things. We completely appreciate that museum staff in countries such as Albania have long been doing the best they can with limited resources and support, and I have edited the post so that this aspect comes across more fully to readers who may not be aware of such circumstances. So many countries have more treasures than they can cope with – we have found this time and again on our travels and this goes for western European countries too. 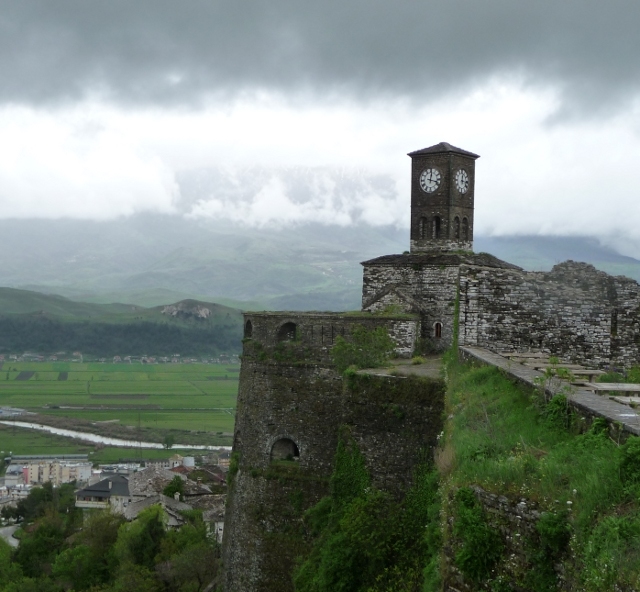 At least Gjirokaster has had some support from UNESCO, there are so many other deserving places that sadly still have no money at all and their precious works of art are in danger of being lost forever. We hope the rest of your week went well. Many thanks for doing the edit, good luck on your travels, enjoy, and take care. I will continue to read with interest to find out where the road has taken you.